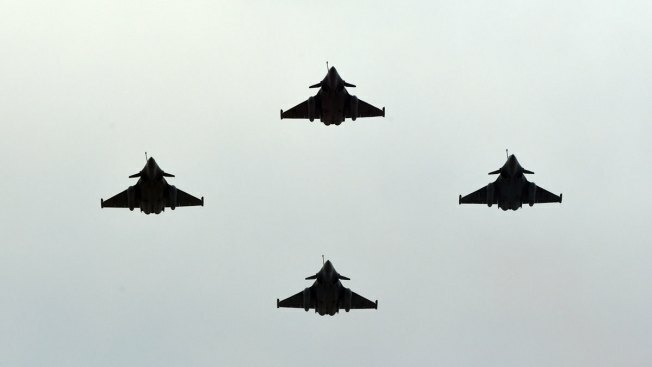 Four French Air Force fighter jets fly in this file photo. French fighter jets launched a series of "massive aistrikes" in Syria, targeting the ISIS stronghold in Raqqa two days after the group claimed responsibility for a series of coordinated attacks in Paris that killed 129 people, officials said Sunday, NBC News reported. The raid, which included at least 10 fighter jets and 20 bombs, was launched simultaneously from the United Arab Emirates and Jordan, officials with the French Defense Ministry said in a statement. "The first target destroyed was used by ISIS as a commanding post. A jihad recruitment center. And a depot for arms and munitions. The second target housed a terrorist training camp," the ministry said.